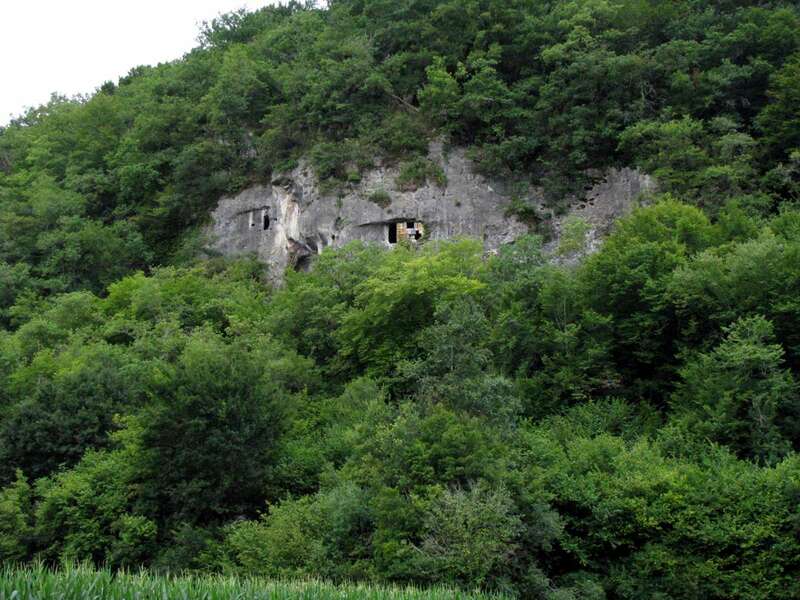 Grotte de Bernifal is a cave decorated with over 100 engravings and paintings. It includes engravings of horses, bison, mammoths and ibex as well as the enigmatic tectiform (roof shaped) drawings seen in many other caves of the same period. 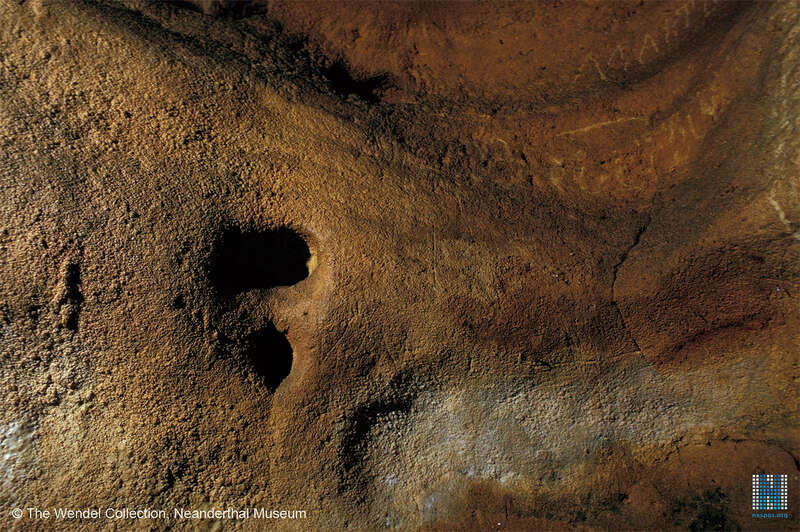 It has changed very little in more than twelve thousand years, and has not been vandalised, since the original entrance was blocked with rubble when the last artists left. Grotte de Bernifal, 'Le Disque'. 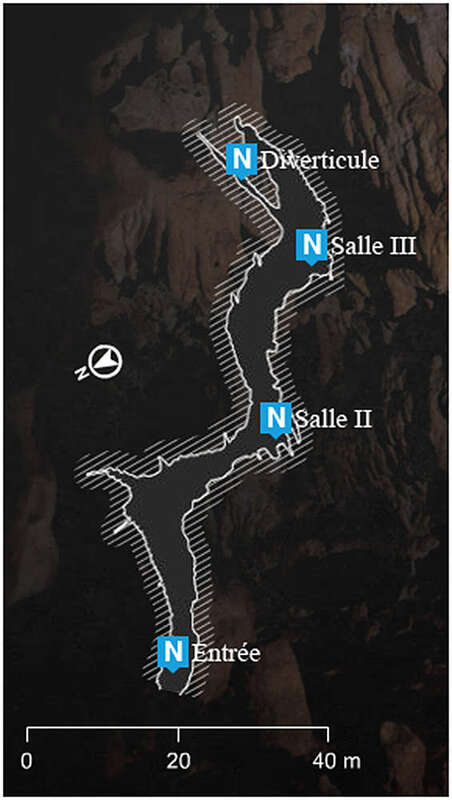 Maps of Grotte de Bernifal. 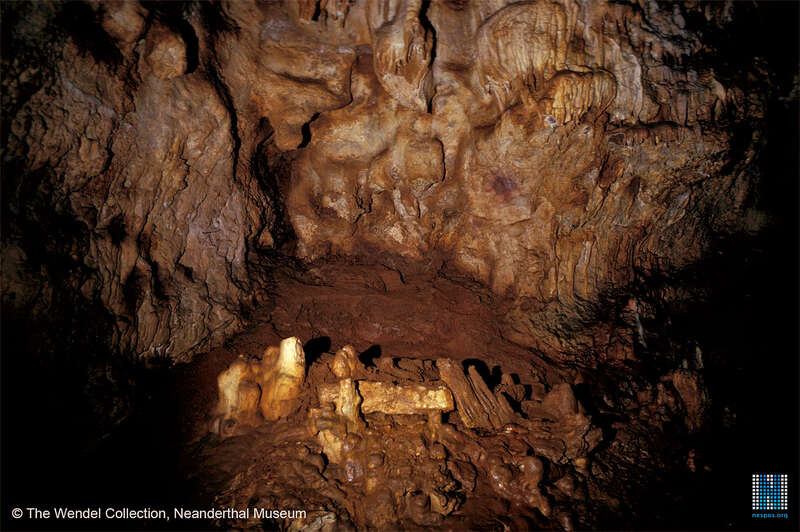 It was discovered in 1902 by Denis Peyrony. Plan of Bernifal Cave after the topographical drawing by N. Aujoulat, 1975. 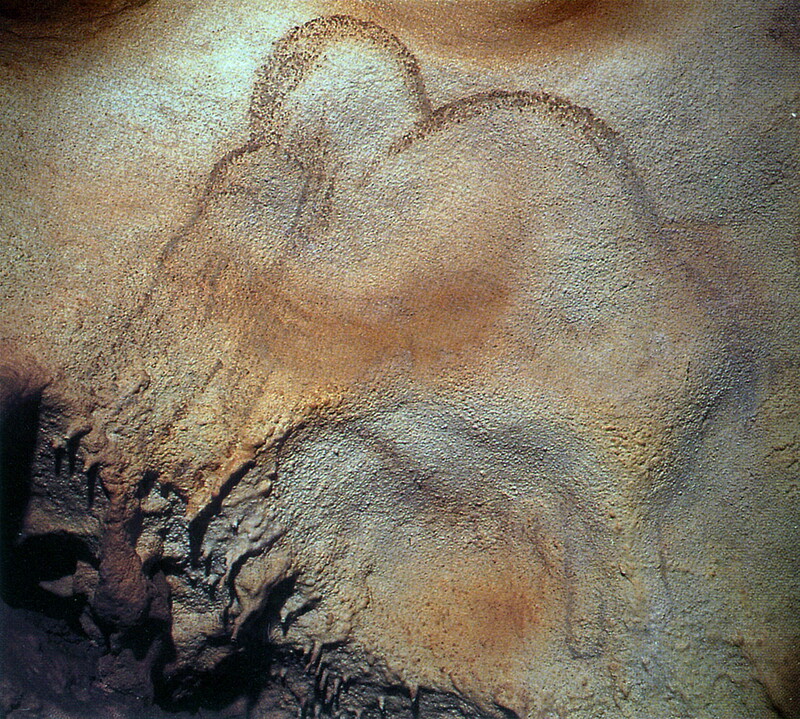 Source: Display at le Musée national de Préhistoire aux Eyzies-de-Tayac. 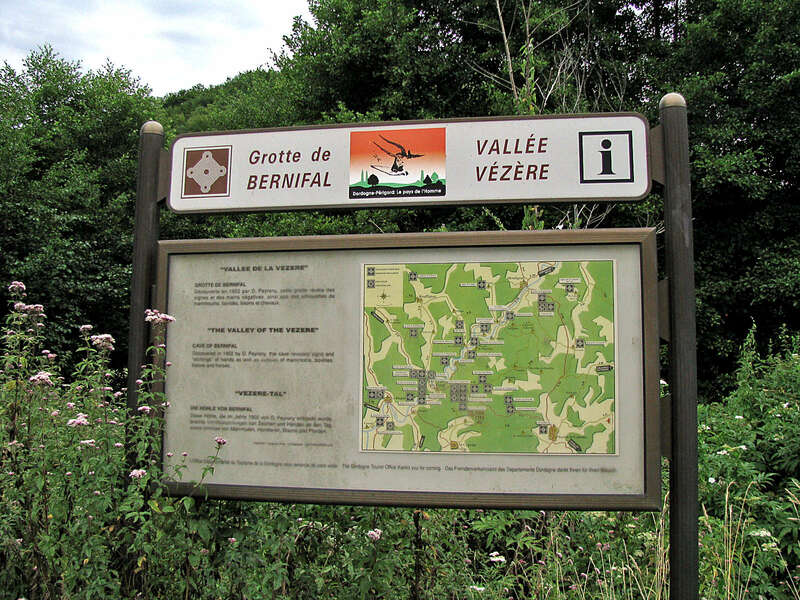 Sign at the carpark at Grotte de Bernifal. Map of sites in the Vézère Valley of France, including Grotte de Bernifal. 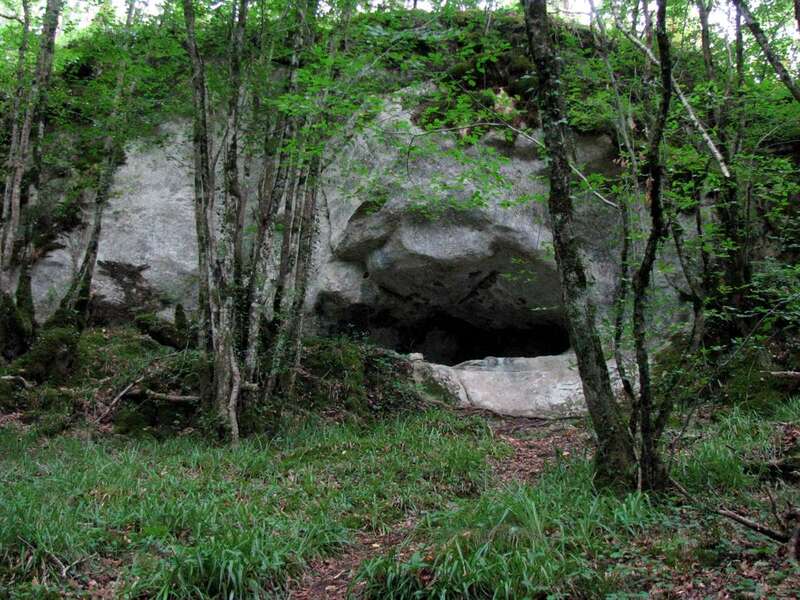 To get there from Les Eyzies, follow the road towards Font de Gaume, past Les Combarelles and Roc de Cazelle, and the carpark near the cave is on the right of the road D47. 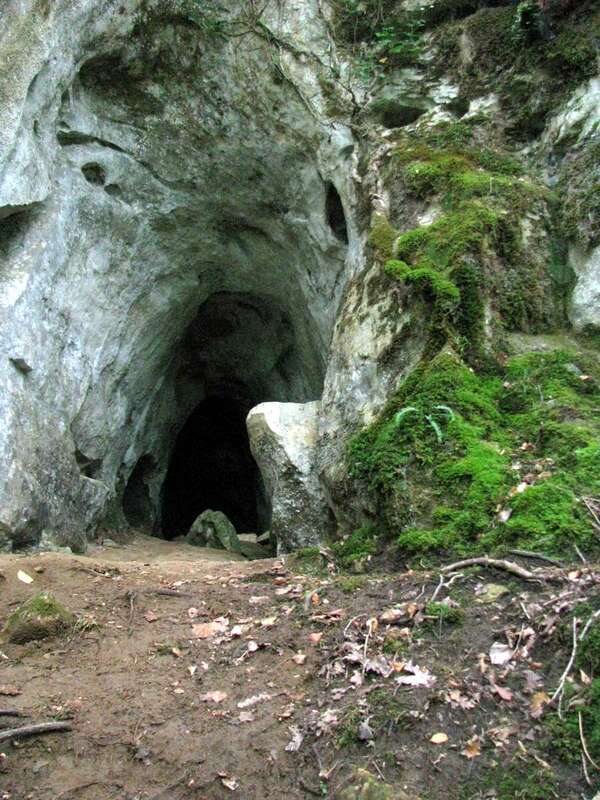 It is a pleasant walk in to the cave, and involves a small hill to walk up, but it is not too strenuous. 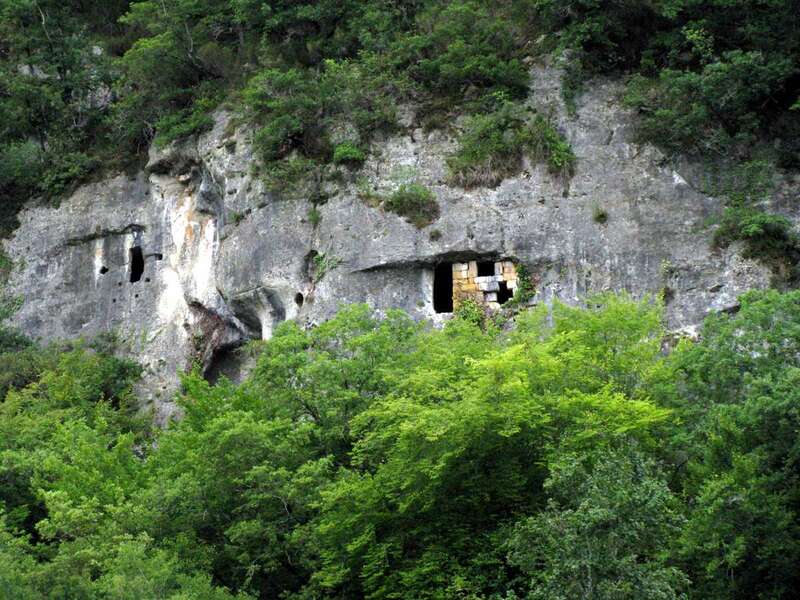 These are former cave residences, or guard posts, possibly from the Middle Ages, when the area was hotly contested by various warring armies. 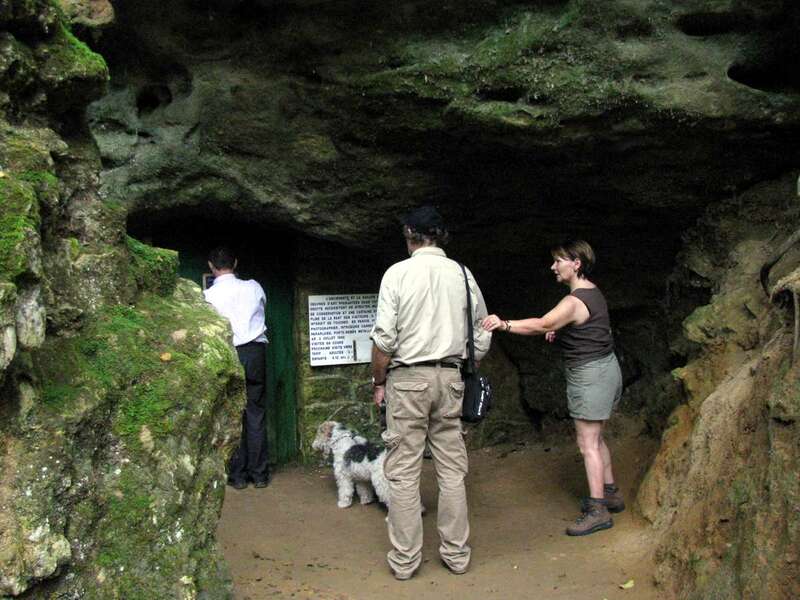 There are some interesting small caves along the way, but none with any archeological significance. Entrance to the cave. 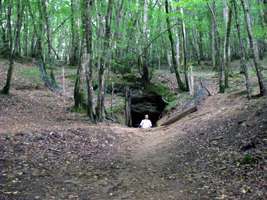 There is another entrance, the one used by Peyrony and others, which enters through a natural hole in the roof, with a wooden ladder fixed to the vertical tunnel. The entrance shown here is the original one used by the artists, which had been blocked for thousands of years until it was excavated again for tourist visits. 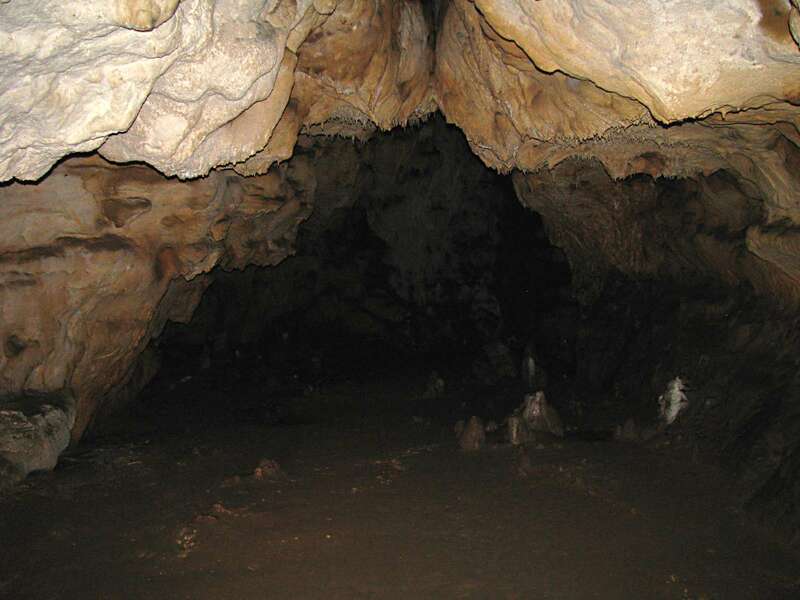 There is no electrical lighting inside the cave. 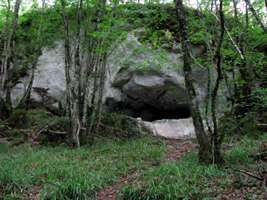 This natural entrance was reopened in 1935 by D. Peyrony, who believed that it had been purposely blocked with rubble by the original artists. It is now impossible to confirm this, but it is an interesting hypothesis. One can only speculate on their reasons for doing so, if that were to be the case. 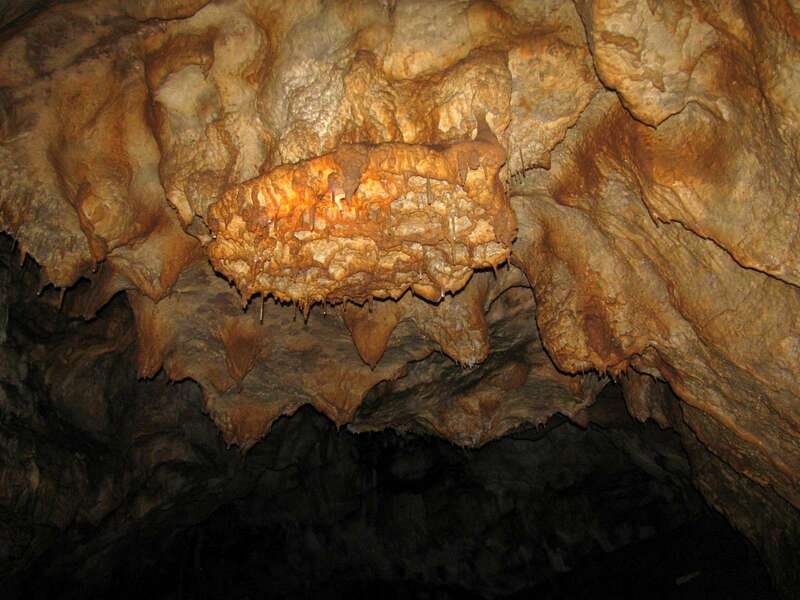 The cave has some interesting formations, including 'straws' hanging down from the roof, where calcium rich water drips from the roof, and as the water evaporates it leaves the calcite forming these very thin strands. This was a particularly interesting circular formation, known as 'Le Disque'. The orange colour comes from iron in the water forming red/orange iron oxides. 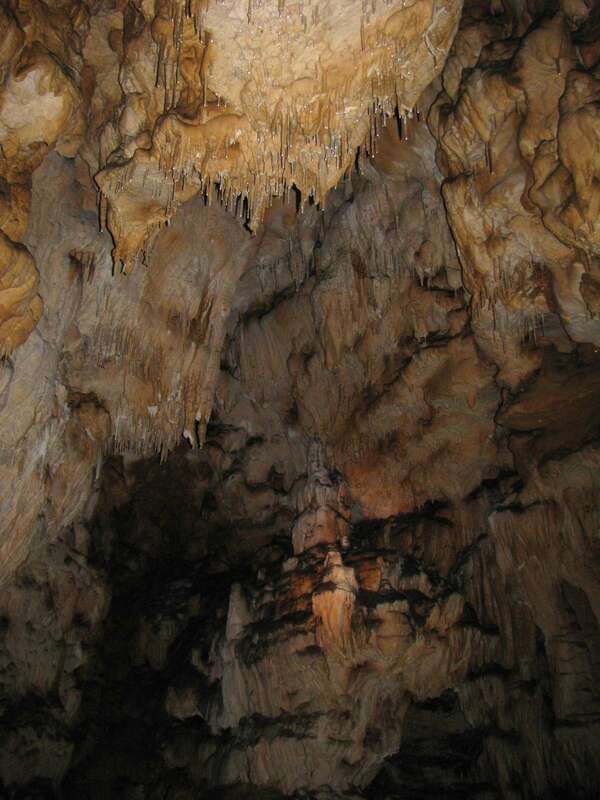 Sometimes the stalagmites (pillars rising from the floor) meet the stalactites (descending from the roof) to form columns, as here. I remember which is which from the phrase "when the mites go up, the tights come down!" Black ochre signs near the entry. A group of black dots. 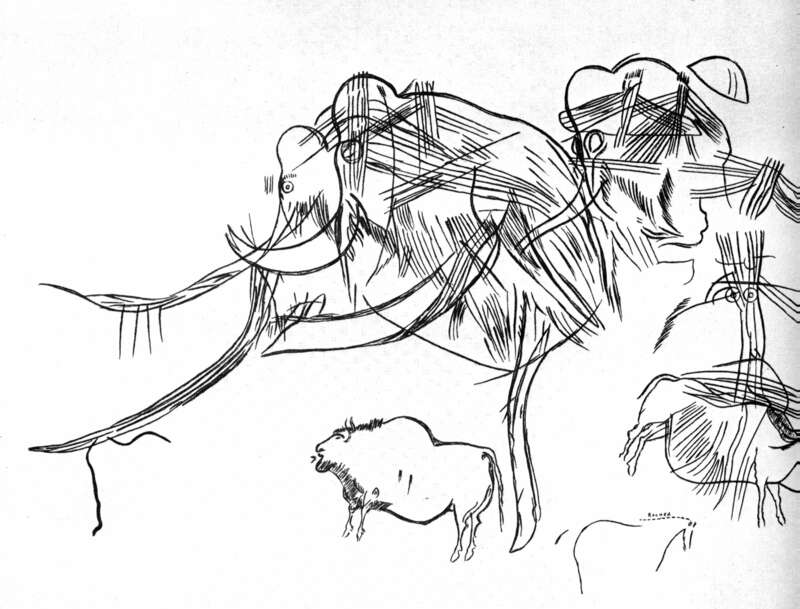 Engraving of a mammoth on the left, and a rounded vertices triangle on the right (see below). 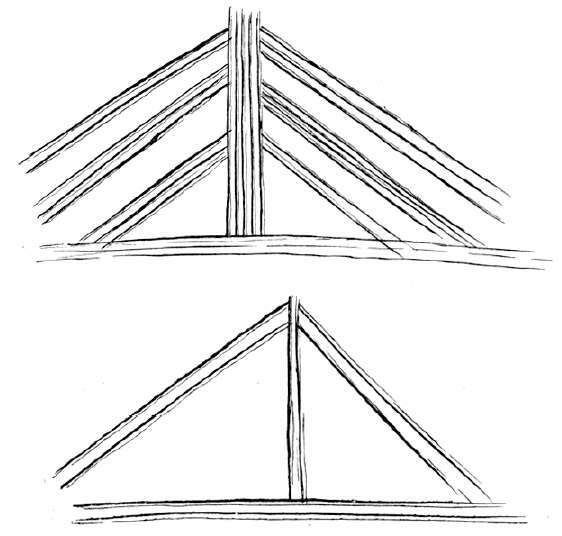 Engraving of a perfect equilateral triangle, with rounded vertices. This has later been crossed with sub-parallel lines. Engraving of a mammoth, as above. Engraving of a pregnant mare. 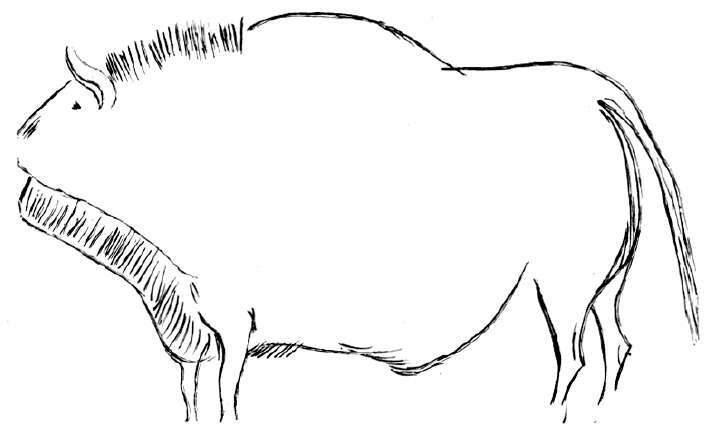 Outline of a mammoth head, trunk, and shoulders. 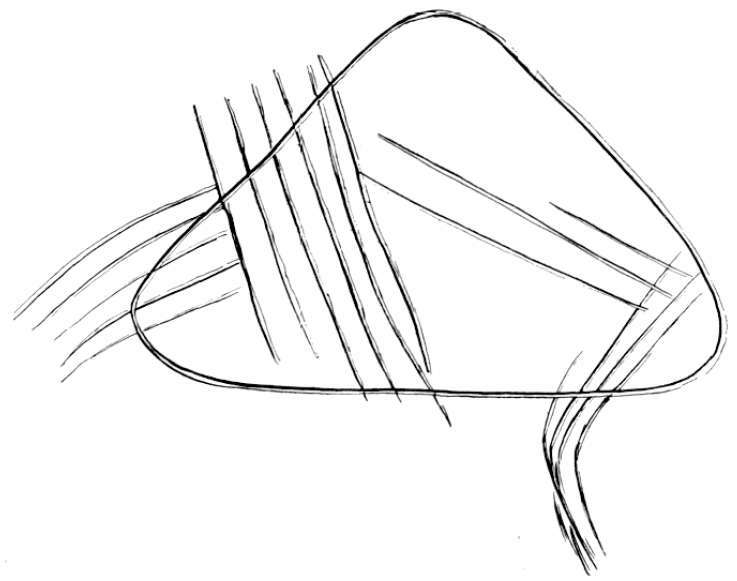 Outline of a mammoth head and trunk. The artist has taken advantage of what appears to be a natural dark spot on the wall to simulate the eye. Stalagmites and flowstone in the cave. Painted mammoth. 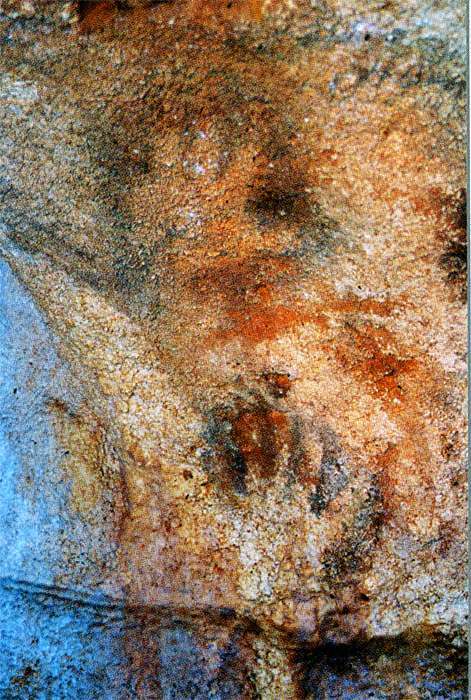 This was painted on the ceiling of a high natural chimney. 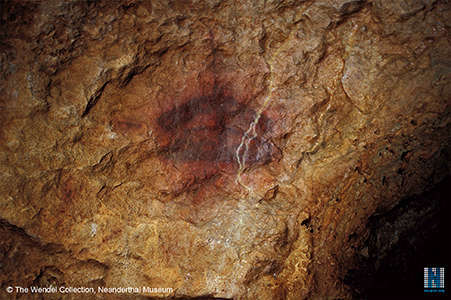 The painting was not discovered until the 1970s. Painted mammoth. Salle II, paroi gauche, diverticule ascendant no. 1. Painted in yellow. 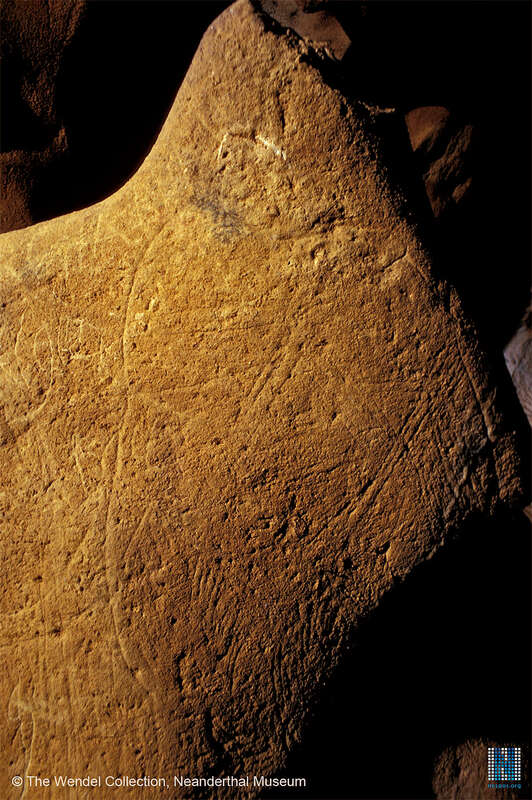 Small engraved horse head, left profile, just to the right of the lower black hole. Tectiform sign photographed in the infrared, composed of about 500 red dots. The sign is hard to discern in ordinary light. Diverticule at the far end of the cave. 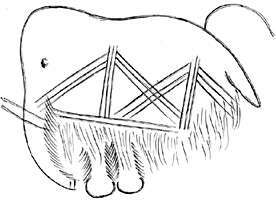 Engraving of a mammoth in the Diverticule. Gilbert Pémendrant, owner of La Grotte de Bernifal, and a guide book with a section on the cave. 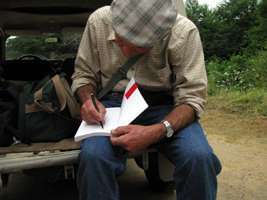 M. Pémendrant was kind enough to sign the book for me. 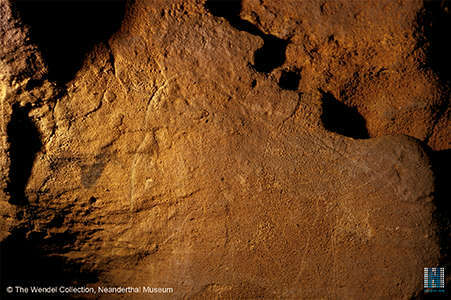 An engraved panel on the right wall of the Passage, with three pairs of tectiforms on the mammoths. Hands on the walls of Bernifal. 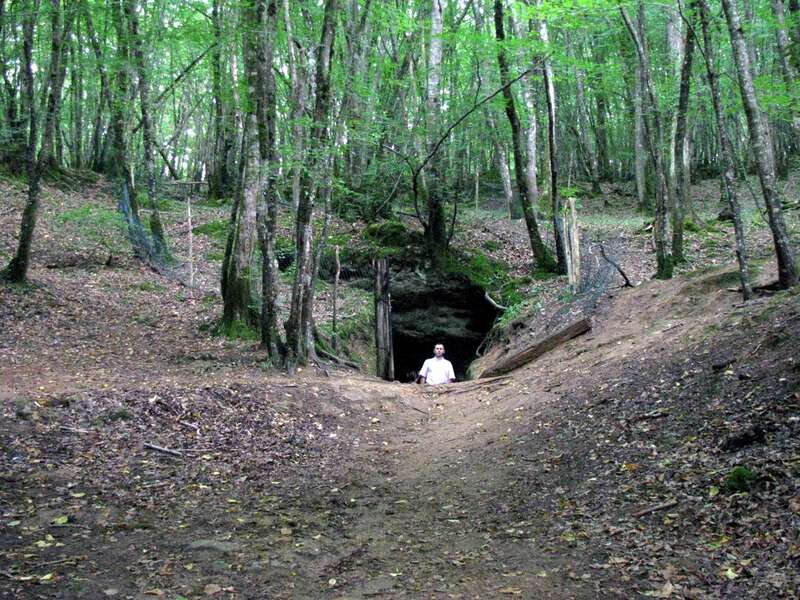 ...At 500 metres from the road, and 20 metres above the bottom of the valley,in the middle of a dense thicket, there is a hole (very difficult to find) that resembles that of a narrow pit measuring 60 to 80 centimetres in diameter. One has to slide in. At a depth of 160 cm is a ledge, and then the opening of a second hole. It is then necessary to let down a ladder about 4 metres, with the help of a rope, through the ceiling of the cave. On descending to the floor of the cave, it may be seen that the old entry is completely blocked by landslides and accumulated sediments. 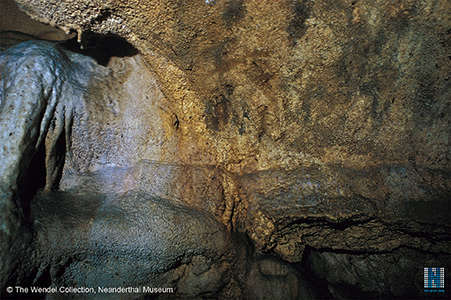 The cave consists of three large rooms connected by corridors. 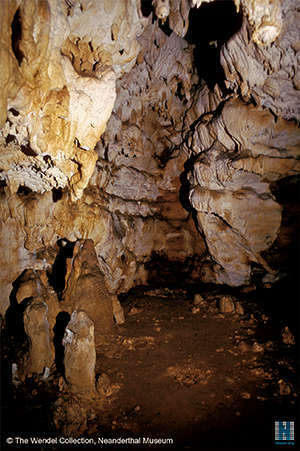 The first room, fairly large, measures 22 metres in length, with a maximum width of 8 metres and a height of 4 to 5 metres. It communicates by a narrow corridor, with a width of one metre, with a second room about 5 meters wide by 12m long and 5m to 8m high. Finally a new corridor of 3 meters wide over a length of 15 meters finishes in a room six meters wide with an approximate length of 20 metres. 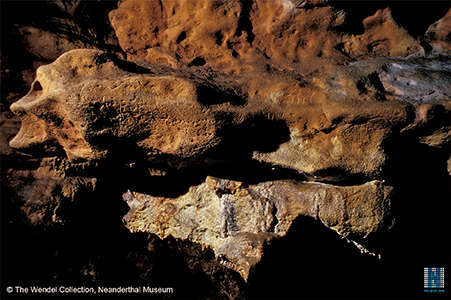 At both ends of the cave, corridors filled with earth indicate that it continues in both directions. The walls and ceiling are particularly wet and covered with a thick calcite coating in general, except in the second room. Of course this is an absolutely dark cave, which is the rule for most caves with engravings. Description of the figures. - The figures are mostly grouped in the second room where the calcite coating is thinner. 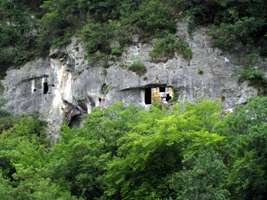 They are quite deeply engraved in the limestone wall and covered with a thin but very hard layer of calcite. 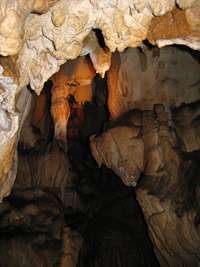 They are placed 50 cm to 150 cm in height above the current floor surface. No. 1 - 40 meters from the entrance, two triangular signs in the form of multiple parallel lines encroaching on each other and with the layout shown. Note the divergent form of the upper part of the vertical lines. Dimensions of each of these figures is 23 cm wide and 20 high. 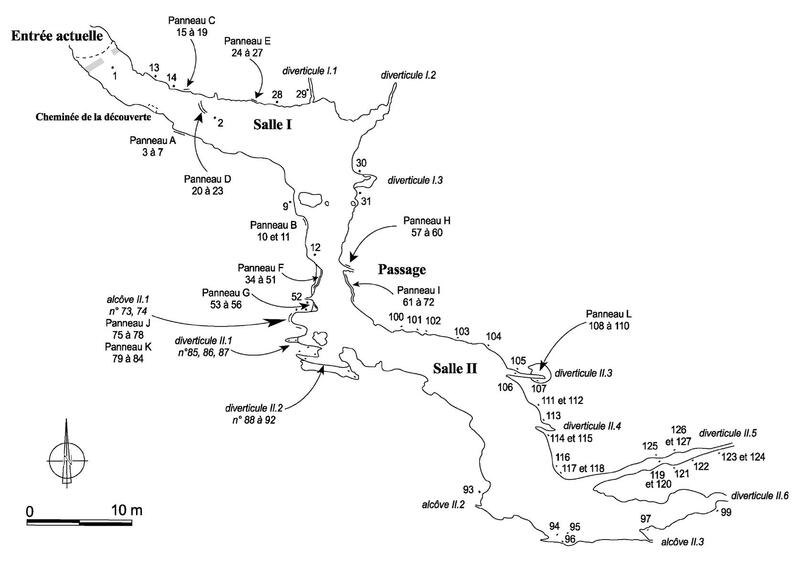 Cette figure, ainsi que les suivantes, a ete executee par nous, d'apres nos calques et dessins. 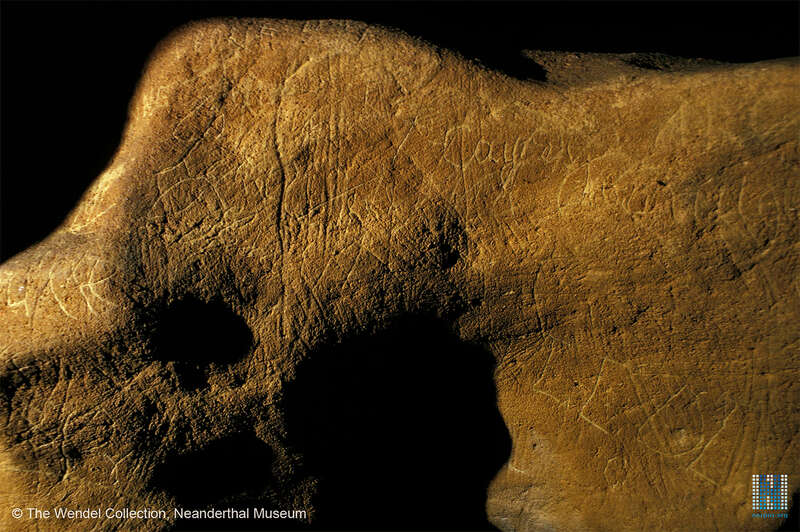 A Bernifal, comme dans nos autres grottes, nous avons fait nous-memes releves, dessins et calques dont nous pouvons ainsi garantir l'exactitude. 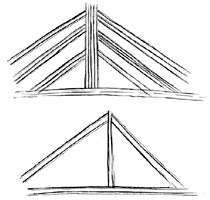 This figure, as well as the others following, has been executed by us, from our tracings and designs. 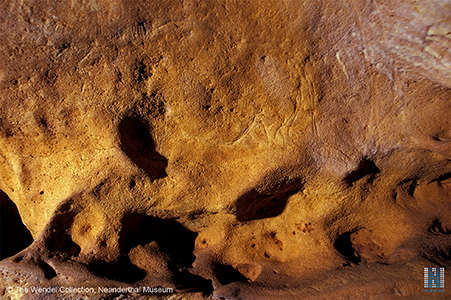 At Bernifal, as in the other caves we have visited, we have made notes, drawings and tracings for which we can guarantee accuracy. No. 3 - A pretty head on the left with the start of antlers indicated, but their upper part is lost in the calcite. It seems that this is the head of a reindeer. No. 4 An incomplete figure may represent the top of the head and the back of a mammoth. No. 5 - A new triangular sign follows. No. 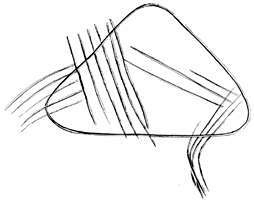 6 - A triangular figure with rounded angles forming a continuous line, and seeming to cover a triangular sign with multiple strokes. Perhaps a drawing of a hut? No. 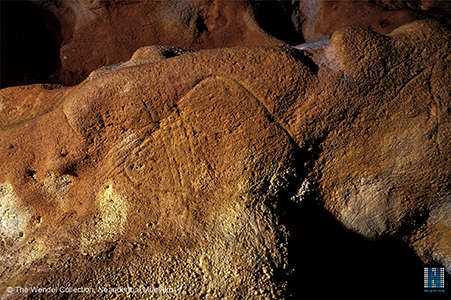 7 - The representation of a small running horse with a big head, erect mane, and a smooth tail, placed high on the rump. This animal reminds one of a mule, or rather the still current wild desert horse of Mongolia, the kertag or Tarpan (Equus prjwalski). Small horse. Below, the lines are black, and to the right, red. Behind this horse, is a nice head that could be a goat or a chamois. Below, a relatively large triangular sign, to the right of which we see a little horse (Fig. 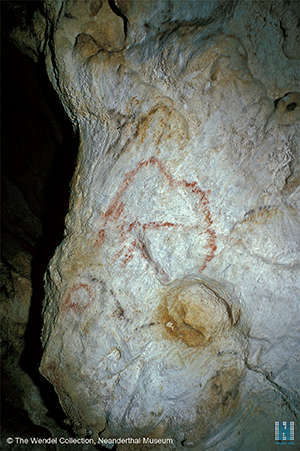 3) with some strokes made using red ochre, and some with black manganese. The technical representation of this animal is rather curious, as can be seen, and differs from that of the other animals. No. 8 - A little to the right of this panel, coming back to the entrance and the wall of another, a little wider, niche, we see the body of a horse, whose head on the right is barely perceptible under calcite. 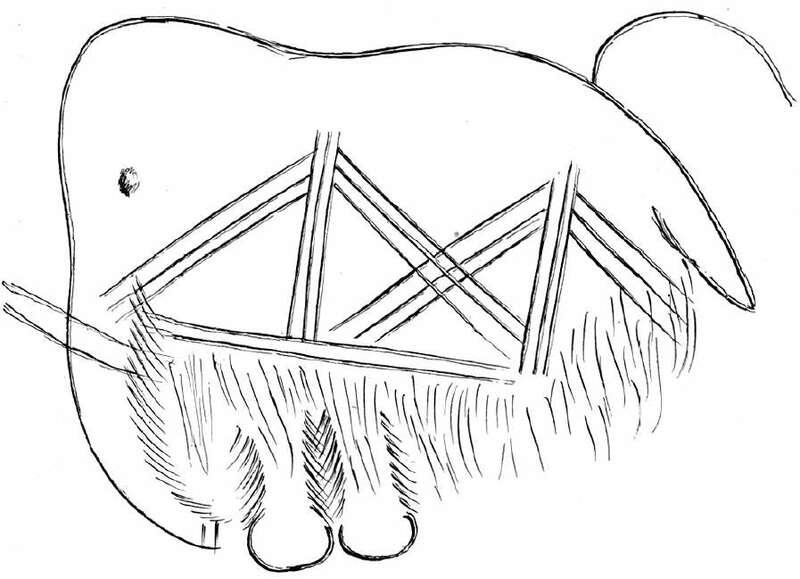 Mammoth characterised by long hairs on the underside. Two engraved house signs on the body. 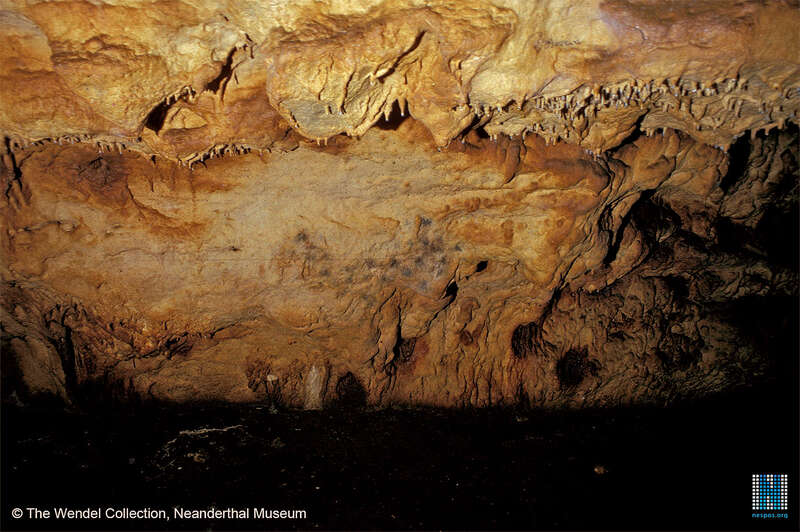 Returning towards the entrance, one finds to the right of the previous figure quite a large panel. 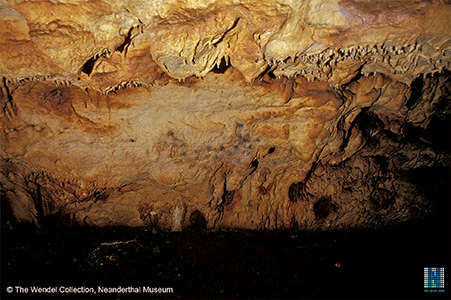 On the left, in silhouette, unfortunately masked in part by calcite, a mammoth measuring approximately 90 cm in length and 70 cm high. 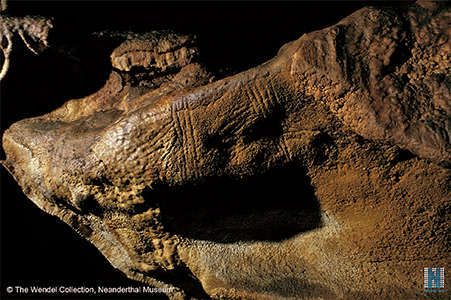 The high bulging forehead, trunk, and long sharply curved tusks are indicated, the tail is highly visible, the feet may be seen under strong hard calcite, and strokes indicating hair on the belly. Two large triangular signs are seen on the head and body of the animal. 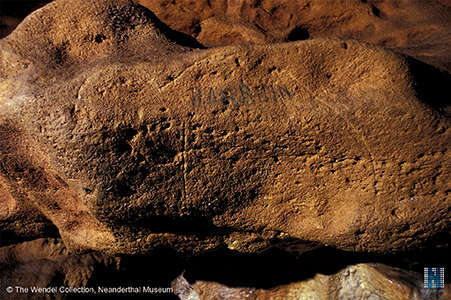 Behind this is a very clear mammoth, measuring about 60 centimeters in length by 40 cm high. The bulging forehead, eye, tusk, and tail are well shown. 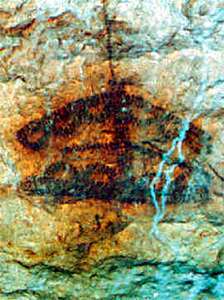 The large feet ending in mushroom shapes are very visible, and the multiple strokes that indicate the hair under the belly of the animal, and even long hair on the legs. Tectiforms behind the mammoth of Fig. 4. No. 10 - Below this last sign can be seen the body of a very well drawn animal. Unfortunately the head disappears beneath calcite. 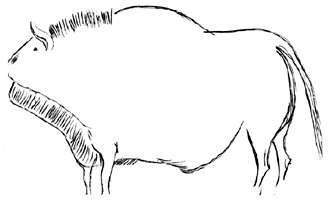 Facing it, head to head, a bison very well characterised by its hump, its highly developed dewlap, its large head, short horns and a tuft of hair behind the head (Fig. 6). It is 50 cm long. No. 11 - Finally a nice head of an antelope may be seen a little more to the right. She carries behind the ear and in the eye touches painted in black. The big nose and the arrangement of horns give it the look of the saiga antelope that is found today only in the steppes of northern Russia and Siberia. No. 12 - There is also at the other end of the cave, in a very narrow niche, a small head painted in manganese of which we see only the nose and eye, calcite covering the rest. You can also see on the top of this head four black lines, and behind it two large black painted lines, each having a little black line beside it. These are the figures that we could recognize very clearly on the walls of the cave Bernifal. There are many other features that we could still identify. 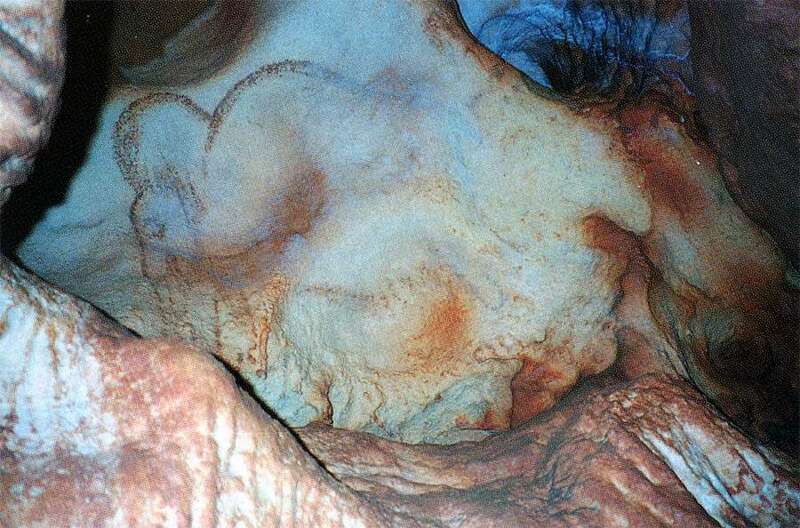 Moreover calcite covers and masks many figures. As they are, those still visible form an interesting group of twenty-six figures divided into twelve different sub-groups. 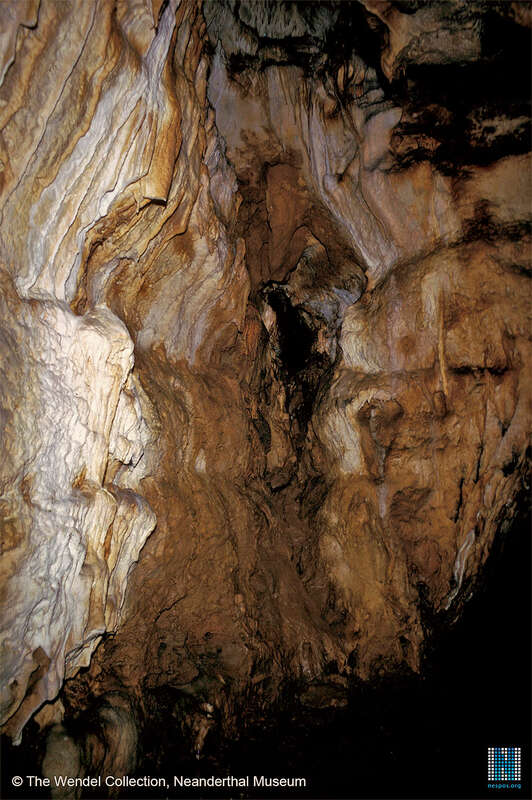 Capitan, L., Breuil H., Peyrony D., 1903, Les figures gravées à l'époque paléolithique sur les parois de la grotte de Bernifal (Dordogne). Comptes-rendus des séances de l'année.. - Académie des inscriptions et belles-lettres, 47e année, No. 3, 1903, pp. 219-230. 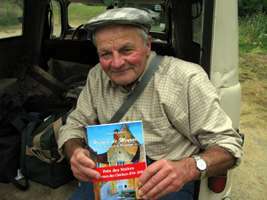 Jouanel J., 2007, Histoire de Meyrals, l'imprimerie M.G.D. Imprimeurs à Sarlat, mars 2007. Plassard F., 2005, Les grottes ornées de Combarelles, Font-de-Gaume, Bernifal, et Rouffignac. 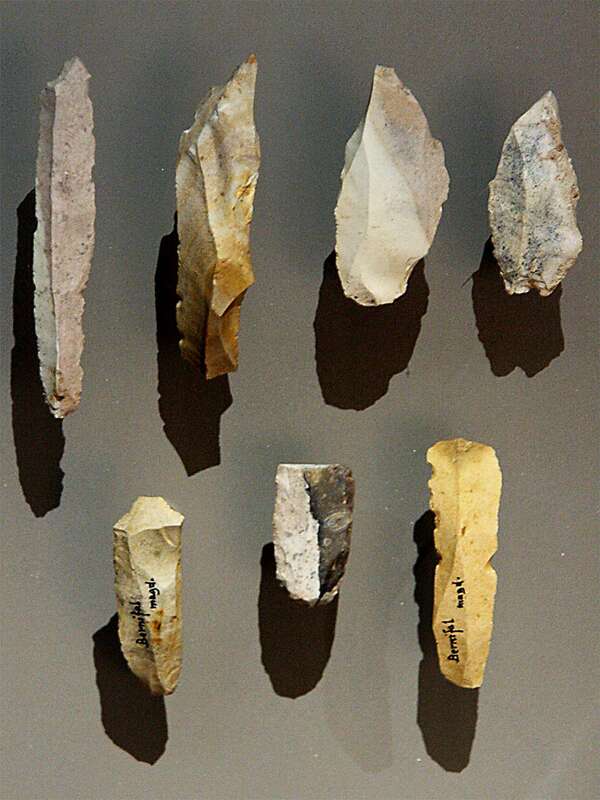 Contexte archéologique, thèmes et style des représentations.Archaeology and Prehistory, Université Sciences et Technologies - Bordeaux I, 2005.